im sorry its been a minute/ new project! yo i know its been a minute but i been on that steady grind. 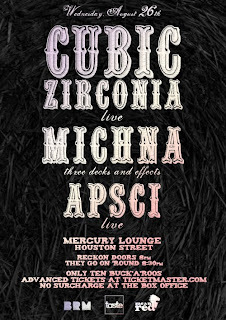 if you are in nyc this week come out to our headlining show at mercury lounge with michna and apsci.. its gonna be major. i see you guys are visiting here. someone email me i wanna come visit there and spin tunes. so its been a hot minute. i apologize for that. I am leaving men women and children. My last show will be 12/29. Skully and Todd are departing as well. I want to thank anyone who reads this blog that is down with the band for a really interesting and special 4 + years. Sometimes you just know that its time to move on, and thats really whats going on. We have a few shows booked in london, and we are in the process of locking down the first NYC show. Other than that i have been working on music with a few other friends, as well as some tunes alone. Hopefully they will see the light of day somewhere sometime. i plan on compiling all the dj mixes and putting them in one place so everyone can get if they need. Zshare and all these sites have been dying a slow death it seems. he worked hard on his record. well hold hands. its real simple. 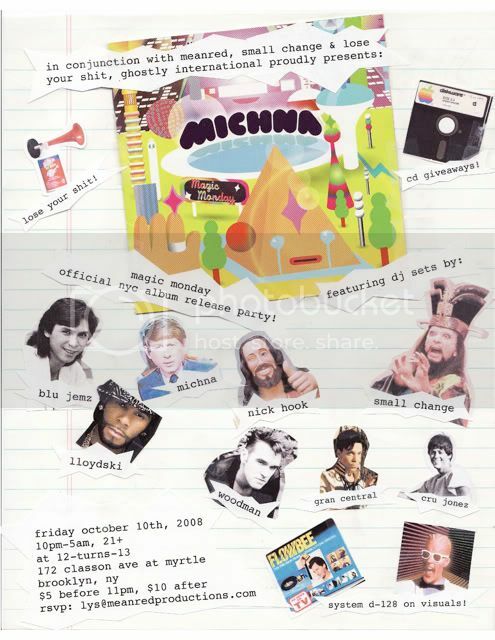 loft party, adrians release, all vinyl.. what more to be said.